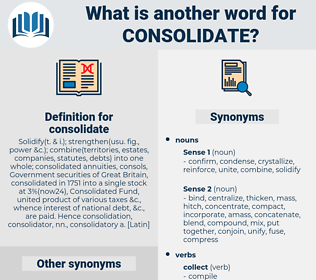 What is another word for consolidate? divisions, Democracies, strengthen, strengthening, strengthens. entrench, lay, fortify, collate, amalgamate, unite, integrate, integrated, cement, buttress, stabilize, strengthen, co-ordinate, coordinate, reinvigorate, sustain, stabilise, reorganize, synthesize, underpin, standardize, reunite, confirm, centralize, incorporate, coalesce, concentrate, perpetuate, streamline, harmonize, assert, recast, institutionalize, uphold, validate, augment, harmonise, reaffirm, remediate, invigorate, reorganise, substantiate, codify, maintain, synthesise, affirm, centralise, shore, anchor, nurture, upgrade, reconcile, summarise, re-establish, assemble, rationalize, summarize, dedicate, reunify, standardise, accumulate, enforce, re-cluster, sharpen, safeguard, restore, devote, encompass, synthesis, congregate, rebuild, rededicate, redesign, enrich, accelerate, reshape, bring, join, redouble, accentuate, accommodate, revitalize, reassemble, replenish, support, supporting, repackage, forge, rectify, overhaul, blend, broaden, preserve, align, re-design, Re-enforce, implement. disconnect, injure, decrease, separate, scatter, discourage, unfasten, weaken, disjoin, dissuade, hurt, enlarge, disperse, part, soften, remove, unmix, thin, liquefy, divide, lessen, melt, loosen. alleviate, deconcentrate, tone, subdue, segregate, moderate, diminish, spread, abate, lighten, decentralize, dwindle, subside, taper, recede, wane, reduce, ease. To consolidate the interests behind them, to arouse and fire the sentiment on which they relied, was now the confessed purpose of these determined men. The professor holds that even if the worst comes to the worst, Germany can always conclude a " white peace" which will leave her the formidable glory of having held the whole world in check, will consolidate her prestige in Europe and enable her, twenty years hence, when she has made good her losses, to establish permanently her dominion. cinclidae, common salt, congealed, coin slot, Comicality, cancellate, common scold, conciliate, chicken salad, concluded, consulate, chino cloth, concealed, cancelled, chamois cloth, consult, cancellated, common cold, conclude, cooking chocolate, cancel out, consolidated, consolida, chinchillidae. solidify, merge, unite, strengthen, unify.